The National Assembly on Thursday passed a revised bill aimed at strengthening industrial safety measures amid public anger over the recent death of a young contract worker at a thermal power plant. The bill calls for contractors to take measures to better ensure the safety of irregular or contract workers and mandates stiffer punishments in the event of accidents. 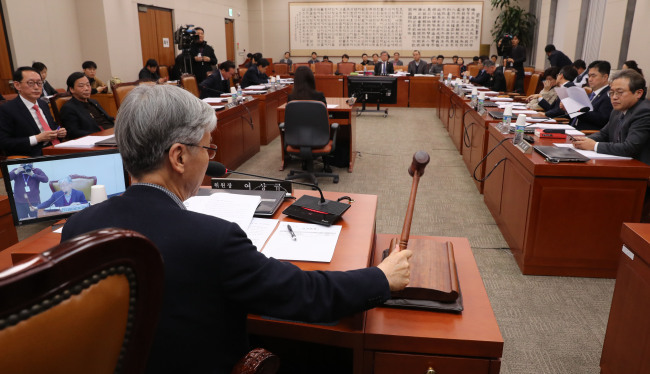 The so-called Kim Yong-gyun act is named after a 24-year-old subcontract worker who was killed in a conveyor belt accident earlier this month at the power plant in Taean, about 150 kilometers southwest of Seoul. His death has sparked public uproar about contract workers' safety and treatment at workplaces and prompted lawmakers to deliberate on the bill for its passage at the final plenary session of this year. Last week, the parties agreed in principle to revise the motion so as to limit the outsourcing of work entailing high risk and guarantee employees' rights to suspend work in case of possible risks. The parties reached a compromise over two sticking points -- contractors' responsibility for the prevention of industrial accidents and the level of punishment for employers in case of fatal accidents. The Assembly also passed the motion that calls for giving 100,000 won ($89.17) per month to parents of children under age six regardless of their income. Currently, families in the top 10 percent of the income bracket are not entitled to the subsidy. The revision will take effect in January next year. Meanwhile, the parliamentary committee on education designated a set of three bills on private kindergartens as "fast-track" legislation amid partisan wrangling. The parties sparred over details of the bills aimed at improving accounting transparency at private kindergartens to curb their irregularities. The National Assembly can designate a bill that fails to get bipartisan support as a fast-track proposal if three-fifths of lawmakers approve the move at a standing committee meeting or a plenary session. Once a bill is put on fast track, it can be put to a vote at a plenary session without deliberation or approval by relevant committees. Earlier in the day, the parties agreed to hold a meeting of the parliamentary steering committee next Monday amid allegations that the presidential office Cheong Wa Dae may have illegally collected information about civilians. Prosecutors raided the presidential office on Wednesday as part of their probe into the allegations after Kim Tae-woo, a special inspector from the prosecution, recently said that he had illegally surveilled many civilians while working for Cheong Wa Dae.